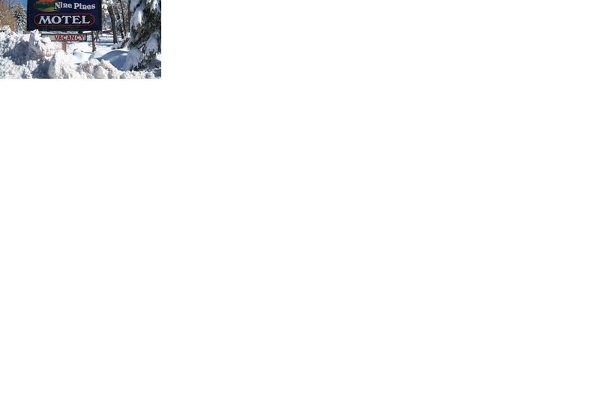 Whether you are planning a rustic getaway or just passing through, our custom decorated, log cabin style accommodations offer all the comforts of home, and a terrific location in the Pines, at a great price. The Nine Pines Motel combines the comforts of vacation lodging with the convenience of a motel, featuring 23 well maintained cabin style rooms with covered porches, vaulted ceilings, and a custom rustic decor. 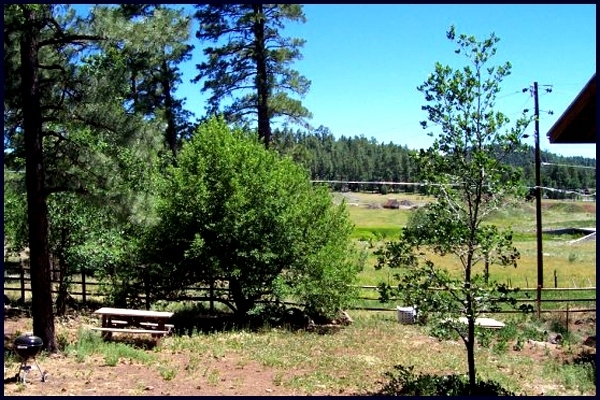 Hiking trails, wooded parks, and downtown Pinetop's finest restaurants and shopping are only moments from your door. 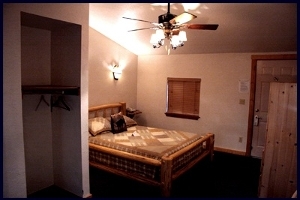 For your comfort and convenience, accommodations at Nine Pines Motel always include ceiling fans, individual heating, a color television with free cable, free wireless internet service, a microwave oven, a mini fridge, and an automatic coffee maker (with complimentary coffee and condiments). We also have hair dryers and lightup cosmetic mirrors (in case you prefer to sit instead of standing in front of a wall mirror) available at our front desk. Free wake up service is provided on request. 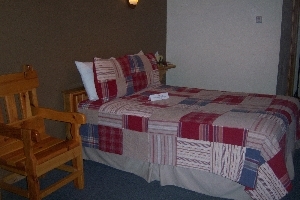 Our rooms feature a charming rustic decor, custom crafted hard wood furniture, wood venetian blinds, custom designed lighting and fixtures, and authentic country quilts on each bed. A fireplace, an enclosed private porch, or an accessible bath are optionally available in select units. Our single full rooms feature cozy interiors and include all our standard room features and amenities. 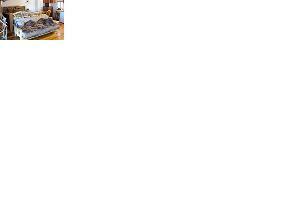 This room offers a beautiful "log cabin style" rustic interior featuring hard wood floors and a fireplace. This spacious room features a charming rustic interior, a futon, and a stunning, enclosed porch. 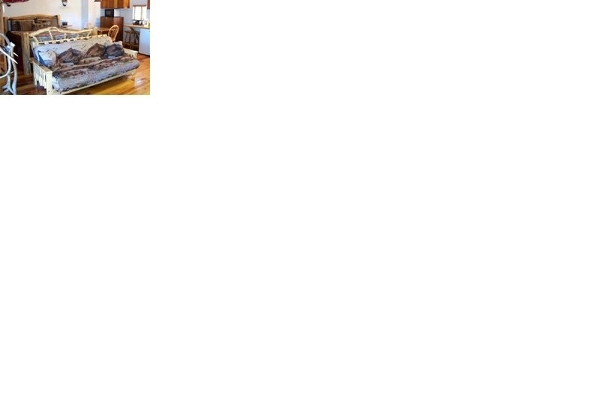 One king size log bed sleeps up to 2 to 3 adults comfortably and the futon easily folds out to accommodate 2 more. 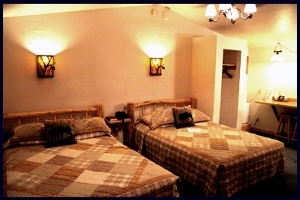 Our single queen rooms feature a variety of rustic interiors and include all our standard room features and amenities. 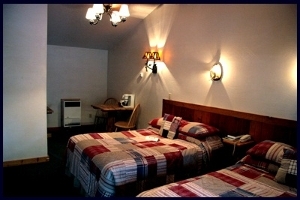 This room offers a campy interior and includes all our standard room features and amenities. 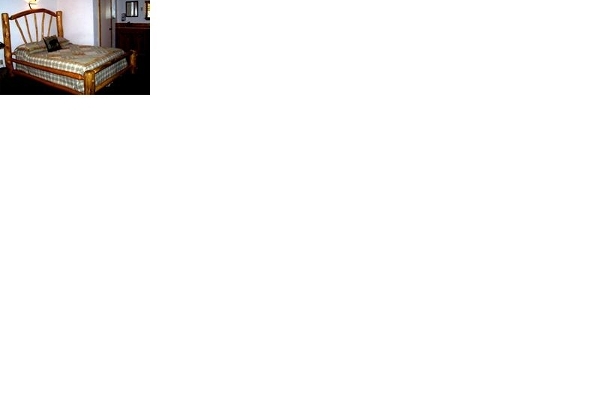 Two full size beds sleep two adults comfortably or two couples, snugly. This room offers a warm rustic interior, counter seating, a wet bar, and a fireplace. 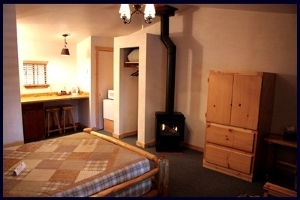 One queen size log bed sleeps up to 2 adults comfortably and the futon easily folds out to accommodate 2 more. 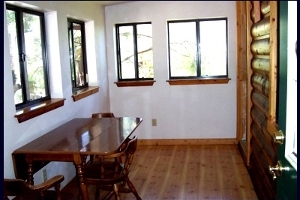 This room offers a warm rustic interior, counter seating, and includes all our standard room features and amenities. If you need to cancel your room reservation, you must contact us at least 48 hours prior to your scheduled checkin time to receive a full refund. In the event you fail to provide at least 48 hours notice, but contact us prior to your scheduled checkin time, you will be charged for the first night of your stay. If you reserved a longer period than one night, you will receive a prorated refund for the remaining balance of your payment. If your scheduled checkin time has already occurred and you are cancelling, you will be charged for each night that has already elapsed plus one additional night (if applicable) and receive a prorated refund for any additional time for which you have paid. If you are contacting us on the last day of your reserved booking, you will not be charged for the additional night; however, no refund will be issued. If you have already checked in, but are checking out ahead of schedule, you will be charged for each night that has already elapsed plus one additional night and receive a prorated refund for any additional time for which you have paid. If you are checking out only one day early, no refund will be issued. If you do not contact us to cancel your reservation, we will assume you still want the room, but are late checking in, and will continue to hold it until the end of your scheduled reservation; therefore, no refund will be issued. Pet registration fees are always refundable, provided you have not checked in with your pet yet. Once your pet has checked in, the pet fee is nonrefundable. The management at Nine Pines Motel is happy to welcome your pet when you come to stay with us. We strongly urge you to read these guidelines prior to bringing your pet to the property. Up to three (3) pets per room reservation are permitted. Your pet is NOT permitted to freely roam the property unsupervised. This includes your cat! Pets are NOT permitted on beds and furniture. you must provide a mobile number where you can be reached while you are away. In the event your pet becomes distressed or disruptive, you will be expected to return to your room and attend to your pet. You are expected to clean up after your pet. You must provide your own poop scoop or litter box, as appropriate. A $10.00 fee is charged for your pet(s) at the time your room reservation is made. This fee is per reservation, not per night or per pet. The cost of any damages caused by your pet while on the Nine Pines Motel property will be charged to your credit card. The best way to avoid damages is to know your pet and bring the appropriate supplies to avoid such damages. Examples of helpful supplies are leashes, kennels, litter boxes, scratching posts, etc. The management at Nine Pines Motel would like to remind you to keep your pet supervised or kenneled, at all times while on and around our property. We cannot guarantee, or be responsible for, the safety of your pet if allowed to roam freely. 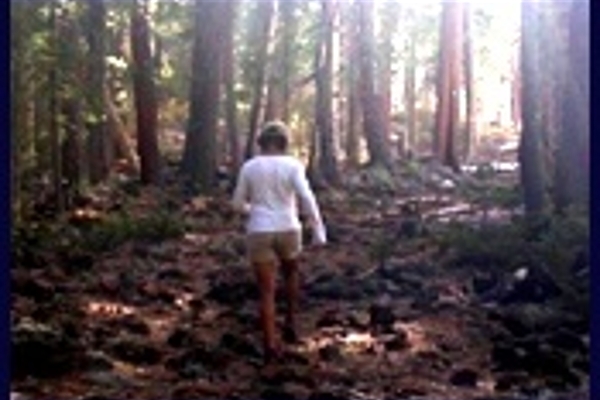 Coyote, black bears, mountain lions, and wolves are always potential dangers in this region and may even be attracted by a domesticated pet left unattended. 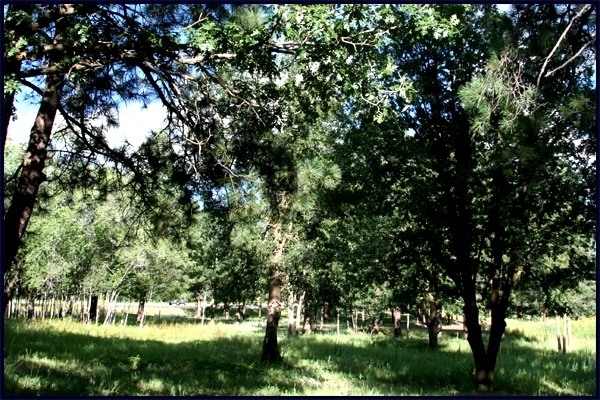 We are also conveniently located near the main road; however, it's not so convenient if your pet is running around loose. Please take care to follow our guidelines to ensure that your pet has as safe and enjoyable a stay as our human guests.